Another demo, some more new products, and witty banter. Time flies. It seems like just yesterday I was playing around with Sparkie. Well, this week we built something else. It's not as dangerous, but it sure is fun. It doesn't have a name either. Let's call it Whack-Dome. Check it out in the video below. Just as a side note, our normal videographer Gregg was out this week, so Dave, Todd and myself decided to tackle the video. We don't have a Vimeo link this week, sorry! We had less than a day to put this whole thing together so there's still some tweaking left to do. Eventually we want to fully enclose it so you can put it on a tabletop to play, fix the scoring, and put a couple different game variations on it. But for right now, it's pretty fun and a great example of what can be done with the big dome buttons. 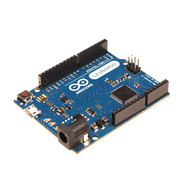 Last week at Maker Faire, Arduino announced their newest development board, the Leonardo. Anyone that's been following Arduino lately knows that this board has been in development for quite some time. We released the Pro Micros a few weeks back which use the same IC and bootloader. The Leonardo uses the ATmega32U4 and is the same form factor as previous Arduinos, but now uses a Micro-B USB connector. We're still waiting on our initial stock to be shipped, but are taking backorders now. Our big dome push button has been pretty popular. But, it was lonely, seeing as we only carried it in red. So, we decided to get it some friends! We now carry the big dome buttons in yellow, blue, and green! Hooray. They are the same button, just in different colors. They use a 12V LED for illumination, but we found it works fine at 5V, albeit a bit dim. 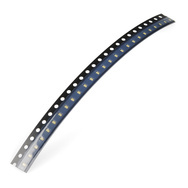 We've had a lot of requests for us to carry SMD parts. We don't necessarily want to sell singles of tiny components, but in strips of 10, 25, or 50, it makes a lot more sense. To test the waters, we grabbed some of the most common components we use in production and cut off some strips and are offering them for sale. 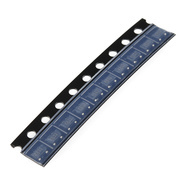 We don't want to compete with Mouser or Digikey, and if you need large quantities, we recommend you use them instead. But if you just want a simple resistor for making an Arduino clone or something, we've got you covered. We've got 10k and 330 ohm resistors. Some red, green, white, and blue LEDs. For capacitors, we have 10uF and 100nF. And lastly, we have 3.3V and 5V regulators. 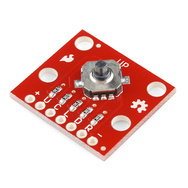 Remember the 5-way tactile breakout? Well, we have a new version that fixes the silkscreen. It's still the same board you know and love tolerate, but with correct labels. Sorry about that! 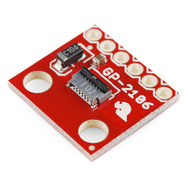 Speaking of corrections, we have a corrected version of the GP-2106 Breakout Board. This one moves the capacitor over a bit so it doesn't get in the way of the ribbon cable connector. Other than that, it remains the same. Another week, another set of new products. Thanks for reading! I'm going to go back and try to get the high score on Whack-Dome. See you next week. "Boom goes the dynamite" - Nice! Stoked about the SMDs! Do you guys think you could make a new "General SMD" Category? yeah, I think some category reorganization might be in order. Let me look into it and re-arrange some things. We'll probably do something along those lines eventually. We're rewriting a bunch of the code that handles our inventory on the back end right now, after which it'll be a bit easier to organize related items. Do you still use that cool looking code base version tracking visualisation thingy-majig that you did a post on about a year ago?? If so, I (probably we) would love to see it! I'm w/ you there, I'd like to be able to get SMD parts here for prototyping SMD systems before I invest in a large amount of parts. How about a giant Simon game? Dome buttons are cool but how about some nuclear power plant buttons? You know, those industrial buttons like you see on control panels and such. Some are lighted, some are not. They are sweet. Maybe a little control box with a cutout panel to hold them. Is that display at the bottom made up of several single alphanumerics, or is there a multi-digit display of those? Ah, well spotted ! Thanks. The SMD components are a great idea - pretty much every place I've found that sells them charges ~$50 shipping, which is ridiculous for $5 orders. As a first project, I would like to build this whack-dome game. Is there a part list and a diagram available to help me? do you sell kit for this? or should be purchased separately? is there any possibility to get the eagle file and the sketch code? At 3:10: Wire ties! Cable wrap, zip ties, something to manage that spaghetti mess! At the very end when you were standing up on the left side of the screen, it looked much more professional than when you are just sitting in the chair. Need more like 1.5A@3.3V to power my 168Mhz ARM, wifi, & camera. What happened to Monday's news post? Where's the white dome button? Anyone else notice that they hadn't connected the car horn to the Relay? Nick was in the background wiring it all up when we were shooting the first part. I wish to see a DIY SMD Ardiuno kit which should contain the bare PCB, all required SMD components, Solder paste, Solder mask, and building instructions. This will be a great value for all hobbyists who would like to learn more on how to build SMD circuits. ChipKit Uno32, just solved an issue for me for some engineering issues I was working on. However, there is a serious lack of good shields. Specifically shields that help match existing shields to work with the new shield pinouts. I am running into this issue with a TFT display that works with Arduino out of the box. The chipkit uno32 pinout does match, but there are issues with port addressing and layout. If some shields were to be designed to help with this issue I would certainly use them. Even just a simple barebones shield like your Arduino Protoype Shield or the Go Between Shield designed for the Uno32 would help immensely. Now that I have used the Uno32 I am not sure I will choose anything else. 80Mhz is hard not to want to use. Big dome push buttons in red, yellow, green and blue, you say? Make a giant Neo-Geo joystick! With that many dome buttons, you guys should try Pop'n Music! Regarding the big dome switches, Do you guys sell an LED retrofit for those of us who have the older red ones with the lamp? Or know where we can get one? that's a good question, but a hard one to answer. they just made a running change and was discovered it through a customer. We don't have any replacements. however, the lamp was just a wedge-based lamp and the new ones just seem to have a resister in series with an LED. You might be able to easily cobble your own the same way. You can't even spell "sentence." You do realize that people can see when you edited your post since it adds "*" right after time? You're a senseless jerk trying to cover up your hypocrisy. Video goes up right after the end of today's Giro d'Italia stage finish. COINCIDENCE? but as many cyclists as we have 'round these parts SOMEONE was watching. Time to put blue leds on my xbox controller and white leds on my ps3 controller!!! I would guess that videographer Gregg also has the lighting equipment normally used for these videos...;) Seriously, the workbench-in-front-of-sparkfun-box-background part of the video looked at most half as bright as usual. Although I do think the shots of the dog were a nice touch, especially the contrast pre- and post-horn sounding. We used my camera, which has a tendency to show things as much brighter on the screen. I usually just use histogram view, but we forgot for the video. Well at least it worked-out fine for the office shots and during the demo.